Have one of these? Or better yet, had an 2009 Abyss from Deschutes Brewing that didn’t seem to taste right? You’re tasting brett. An unintentional side-effect of the use of a wild yeast in the brewery. Dissident, an overwhelmingly popular Oud Bruin uses brett yeast for the sour flavor. The Abyss- and imperial stout doesn’t. Some of the 2009 batch of Abyss was found to have the unwelcome yeasty guest. 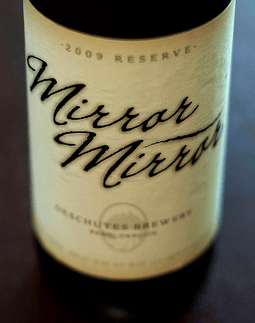 Some of Mirror, Mirror an American Barleywine also is found to harbor brett. There is one thing I want to stress with this. As a biologist, this really isn’t a result of sloppy brewing techniques. Brettanomyces is by nature – wild. It’s a rebel. Uncontrolled. Deschutes attempts to be diverse in their brewing styles. Sometimes things just don’t go your way. Regardless of how you hard try. We have detected in our lab a similar condition to The Abyss 2009 where some (not all) of the bottles have brett in them. It is interesting in that there seems no way to tell short of general tendencies in storage conditions where the brett will develop to sensory detection levels. At Deschutes Brewery we take these things seriously. We know many of the wine barrels we use will have brettanomyces (wild yeast that produces flavors that are not desired in some beer styles) in them (just ask any winemaker). Going forward, we have purchased a flash pasteurizer and all beer from barrels is now pasteurized (killing the brettanomyces) before it is blended with beer from tanks (that is not pasteurized). Then the final blend is bottle conditioned so all beer is alive when you get it. 2010 The Abyss was treated this way. As for the Mirror Mirror or 2009 The Abyss, we will refund and arrange shipment for unopened bottles back to the brewery. As with any of our beers if someone has an unsatisfactory experience, we will make it right. Unfortunately, we cannot compensate for above market pricing paid over the internet or other “extra-market” sources, nor can we send a replacement beer in lieu of payment. Suffice it to say, however, we stand behind our beer and the experiences we deliver. You can contact us directly through our website. Big fan of Deschutes. Best of luck in the future. I’m a huge fan of Deschutes, and no doubt their brewing is pristine. This is unfortunate for any beer-maker. I went to their brewery in Portland two years ago and had the best time. One of the highlights of the Atlanta-to-Portland drive with my cousin (a wine trip, really, but certainly wasn’t lacking in beer experiences). Anyhow, this definitely won’t keep me from buying Deschutes when I see them.